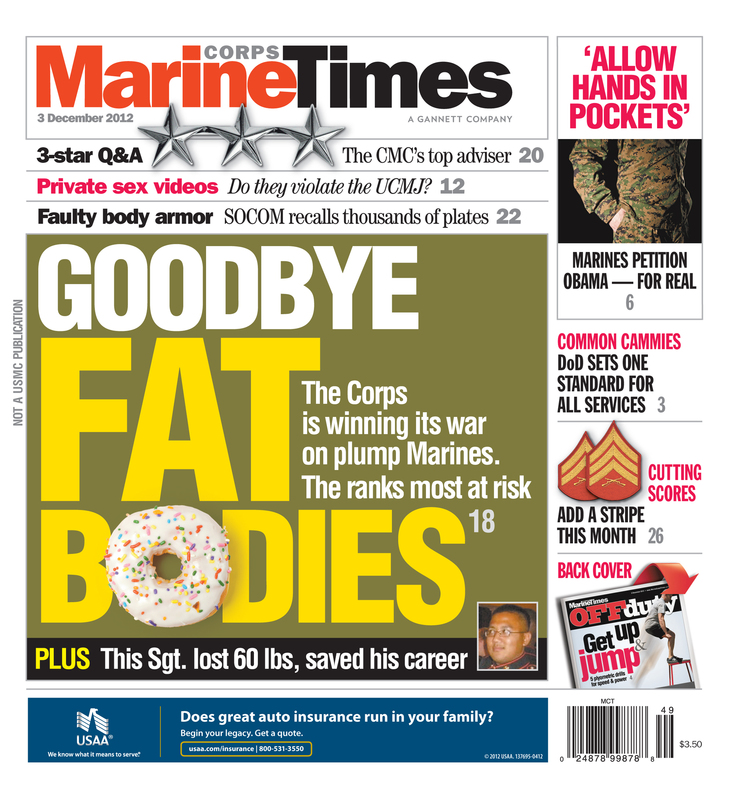 This week’s Marine Corps Times takes a look at the Marine Corps’ intense efforts to bring all Marines in line with the service’s body fat standards. After the growth to 202,000 Marines ended, leadership cracked down on fat Marines, and thousands were assigned to the Body Composition Program in 2010. But with the drawdown now underway and competition at its peak, those numbers have fallen steadily each year since. Other services, which have also re-emphasized fitness standards, have seen even more dramatic results than the Marine Corps, with significant increases in the number of soldiers, sailors and airmen getting the boot. But it isn’t all good news for Marines in uniform. Even though most of those who end up in the BCP escape, time in the program can prove an indelible black mark that can haunt them come promotion time. Some even consider it a career ender. That drives some to extraordinary — often dangerous — measures to make weight. We talked to one Marine who was at risk of being booted and got back into regs with proper diet and exercise. But another says he is done with it all. He has put his body through hell to meet standards that some say are biased against certain body types. He isn’t willing to risk his health any longer. For the details, pick up this week’s Marine Corps Times on newsstands now. Or subscribe here.